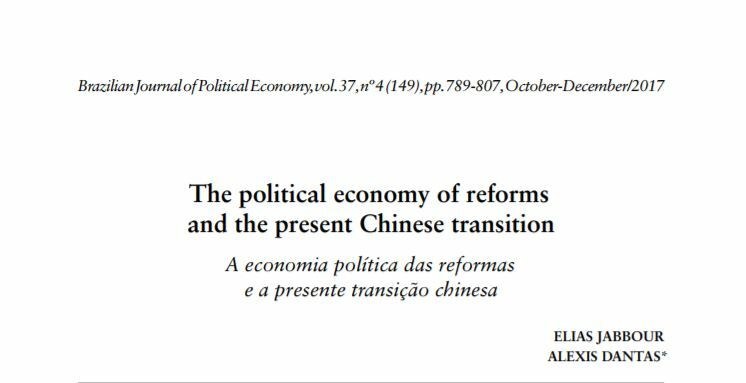 Elias Jabbour and Alexis Dantas, two economists in Brazil, have published an important study of China’s economic reform ‘The political economy of reforms and the present Chinese transition’. In general this refutes many myths on China’s economic reform in analysing the relation of the state and the market in China’s ‘socialist market economy’. It is a good introduction for economists to the processes during China’s economic ‘reform and opening up’. For specialists I particularly found extremely valuable, collecting together much information, the section on the decisive role played by agriculture during the launching of China’s reform in 1978 – I knew the process in general but this provides much detailed information I had not seen elsewhere.